So, how do I start selling my photos? Firstly, Download ScoopShot for iPhone or Android and install it. For iPhone, you can find it on App store and for Android you can get it from the Android market. Now, it’s time to get rolling! Start Scoopshot and tap the lens logo and click a snap. Set a price for your photo and explain what makes it special and unique. 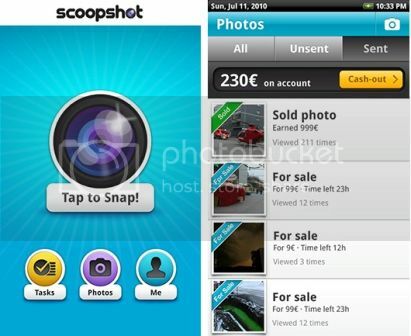 Next, send the photo directly to Scoopshot store using your phone! If someone likes your snap, they’ll purchase it and you’ll earn money! You’ll be notified when your photo is sold. Scoopshot helps you set your price and earn money. If you’re good at photography, I would definitely recommend this to you. Successful Scoopshooters have earned thousands of Euros! So, what are you waiting for? Grab your phone, get Scoopshot! It’s time to click a snap!